Well, I’m thinking that I might have lucked out by being able to purchase this item from Amazon. I was actually surprised that it was available to order as it is usually difficult to purchase mod chips and related hardware from commercial retailers in the U.S. Yet, I did actually receive an R4 Gold Pro Revolution. The cartridge enables a 3DS (and other systems such as the DSi) to run homebrew software. It’s easy to use, though it requires a micro SD card in order to function and some software that must be downloaded from the manufacturer’s website. The cartridge gets around the typical mod restrictions by simply presenting itself as a valid game to the system. On the DSi I was able to run some Nintendo Entertainment Emulators (NES). The 3DS is capable of running several others including a Super NES emulator. Overall, I think this is a very cool upgrade for the 3DS. Having accumulated several devices that charge via USB, sometimes I don’t have enough USB block plugs on hand (and other times I’m just tired of digging around to find the adapters) to charge everything up at once. 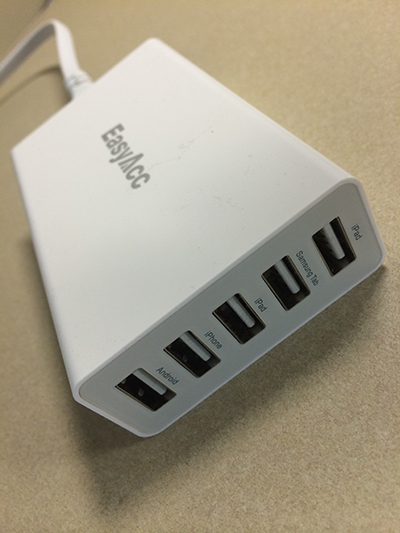 Last week I purchased a couple of 5-port USB wall chargers (EasyAcc) from Amazon for less than $20 each, which have helped make this minor inconvenience less of an issue. This particular model isn’t something I plan to move around frequently. Instead I have located them in key spots where they’ll remain most of the time. One is at my office and the other is in our guest room. So far they seem to work well and they’re about as simple as expected (and needed). There is one thing of note that interested purchasers may need to be aware of. The USB ports do not all provide the same level of output, though it’s clearly marked on the device how much power each port provides and it’s unlikely to be an issue for most people. The Short Version: The Philips VOIP0801B/37 Skype Phone is not fully compatible with Skype and Mountain Lion. The microphone and speaker work fine but the keypad does not. I’ve had a Skype account for some time though I’ve never used it very often. In general, it serves as little more than a backup calling system. I’ve been thinking about using the service more often at home so I decided to try to find an inexpensive device that would serve as a dedicated Skype phone. Earlier this week I received a Philips VOIP 080 Skype VOIP Travel Phone (VOIP0801B/37) that I purchased from Amazon for about $30. Unfortunately, I should have read several of the reviews more closely when trying to determine whether or not this would actually work with my Mac (10.8 Mountain Lion). It partially works. The Mac recognizes the device connected via USB and the Skype software can be configured to use the microphone and speaker. However, the keypad appears to be useless. Dialing, etc has to be done from the Mac. Before I purchased this I was well aware that Macs were not officially supported but I had the impression it would actually work. Perhaps I’ll stumble upon some trick to get the keypad working with the Mac but for now I’m stuck with a device that doesn’t work as I had hoped because I didn’t research it adequately. Updated 07/06/2014: In the end I was never able to use it as I had intended. It’s now in our collection of yard sale items. Tangled earbud wires is a frustration you’ve probably dealt with many times. I was always surprised at how easily small wires would become tangled around other things in my backpack. One of the ways I dealt with this was to store them in an empty prescription bottle. This method worked very well but it did draw the odd question or stare once in a while. To avoid these relatively minor issues I ordered a couple of Case Star Clamshell Earbud Cases from Amazon, which only cost about $7 each. I don’t have any complaints – they serve their intended functions quite well. Updated 07/06/2014: There isn’t much to state about these other than the fact that they’ve held up just fine and they’ve also helped preserve the condition of my earbuds.